Are you connecting with and empowering your customer advocates? If not, you should. Here’s why. Customer advocacy marketing programs help you increase revenue by improving customer acquisition and retention (and they’re your best source of leads). How? Because you’re helping to encourage and motivate happy customers to speak about you positively to others. And delighted customers are your most powerful hidden sales force. For example, in 2016, IDC research found that only 10% B2B companies surveyed had a customer advocacy program in place. This year, “The Role of Marketing in Customer Advocacy” report found that has increased to 67% which is a 570% increase. That’s why I interviewed Mark Organ (@markorgan). Mark is the Founder and CEO of Influitive and he’s been a thought leader in the space of sales and marketing technology; a real innovator. I’m excited to bring his thinking to you on customer advocacy. Tell us a little bit about your background and what inspired you to start Influitive? Mark: Yeah, thanks. I’m really excited to be here, Brian. I think this is an amazing podcast and I’m excited to share my story. I’ve lived a number of lives already. One of them, before I started Eloqua in 2000, was as a research scientist. I was actually a Ph.D. candidate in neuroscience at Northwestern University in Chicago. I was really fascinated by how the brain works and what were the biological bases of behavior. It was fascinating for me. Although research, while fascinating, has some challenges concerning it, especially getting paid well. I also wanted to spend more time with my wife, so I left the research world to get in the business world and joined a Bain & Company as a management consultant; from there I started Eloqua. The other big thread in my life other than being a scientist was being an entrepreneur. I started companies even as a teenager, as far back as age 13. I’ve always been really fascinated with working for myself and satisfying customers. Really, I think now I’m bringing both of those together in my company where I still feel like I’m a scientist. I still feel like I’m trying to discover what makes human beings really work and tick, but also being an entrepreneur, building software for marketers and leveraging the understanding of people and what drives them. Regarding what motivated me to start Influitive – we’re an advocate marketing software company. So we believe that the future belongs to companies who, as opposed to marketing directly, they do a better job of discovering and nurturing and mobilizing their customers to do the marketing for them. We think the future is for companies to get their customers to do the sales and marketing for them. We built some software for discovering, nurturing and mobilizing advocates. I got the idea while I was at Eloqua. It was 2005, and great VC convinced me to spend a couple of weeks out in the field to understand how and why people bought my software. What I learned was when we sold software efficiently it was because there was tons of this advocacy involved. There were multiple referrals on the way in. There were lots of case studies that were relevant on the website, the best references and those prospects went very quickly. At the time, Eloqua was a bootstrap startup, so selling our software quickly was super important. I got really excited about this idea of advocacy, but it turns it was way harder than I thought to generate consistent advocacy. That’s because we didn’t actually understand what motivated the advocates. I really wanted to understand better what motivated the advocates. Through some interviews and lots of other things like that, I began to figure out what drove advocacy and unfortunately, I couldn’t work on that at the time I was at Eloqua, but when I had a chance to transition out I had an opportunity to work on it at Influitive. What are some of the lesson’s you’ve learned about building a company with the customer at the heart of your business? Brian: That’s really cool just hearing how you brought together the two worlds as the scientist to understand what motivates people and then putting in a way that you’re able to help people. I’d love to hear some of the lessons you’ve learned about building a company where from the beginning the customer is at the heart of your business model. Mark: I’ve learned a lot just of how to build a company. Regarding putting customers at the heart of your business model, one of the things I learned the hard way, coming from Eloqua, was how important the employee experience is. I think one of the big differences between the two companies is that while I was at Eloqua I was very obsessed with what we called our True North, which was measurable value to the customer, and that’s a pretty good thing to obsess about. If you are making your customer money every day, you’re likely to have some success, but one big change that I made at Influitive was really treating my employees as my primary customer, making sure that I was providing the best possible experience for them. There is so much money that’s available for companies if you can generate the growth and if you can generate an efficient business model. The people who create that efficient business model and that growth are our people. Talent is a scarce resource today. That’s a big fundamental shift for me, and honestly, I think it mirrors a significant shift even in the marketplace. I think that if companies today don’t treat their employees as their primary customer, the future is not going to look too bright for them. That’s one key thing that I learned regarding building a company. The way we built our software came from the knowledge that I gained from interviewing hundreds of super advocates. Literally, understanding people who might generate several referrals a quarter and be available for references on demand and love to speak on stage for you…all those active advocates that all of us really depend on. None of us can build a successful business without having our customers who are doing that sales and marketing for us. Our lifetime value of the customer and the cost of customer acquisition would be entirely out of whack if we didn’t have that working in our favor. There were some things that I’ve learned about that. On the macro level, there are three things that I’ve learned that are really important. The first was that people advocate more when they feel like their part of an exclusive tribe, like when they belong to something that’s bigger than themselves then that’s when you see a lot more advocacy. For example, you can see that at a sporting event. When you go to your local stadium, you’ll find people whose faces are painted in the colors of the team. Why do they do that? Well, they do that because they want to belong to something that’s bigger. They want to be part of an exclusive tribe. That’s what we found. When companies do advocacy programs, if they can give it the right name and the right feel and the right brand and really make people feel like they are special and exclusive you get a lot more advocacy. That’s the first thing. Second, we learned is that people want to be able to experience the impact that they made on a company. I learned this firsthand. As part of foundational learning for starting my company, one of the things that I was excited to do was learn Mandarin Chinese. I thought it would be a cool thing to do. I learned to speak enough Chinese with this amazing product that, after six months, I was able to have a meeting in China without an interpreter. It was a pretty amazing experience. I used this product called ChinesePod.com and what I found was that (you can see now, I’m still advocating for it) my advocacy really waned over time and it was because I wasn’t really feeling the impact I was making on the company. I didn’t know what the results were of the referrals that I made as an example. We’ve learned that if you give advocates feedback, they respond better. If you let people know the impact of those referrals that they’ve made if you let people know if they’ve written a guest blog post or they’ve been on a podcast, just like this, how many hits did that podcast get? Did they get a thumbs up? Those sorts of things generate a lot more advocacy because people are getting that feedback. The third is social capital. If people are experiencing benefits in their life, their career, as a result of the advocacy they are making, they are going to do a lot more of that. Those are three sorts of social/psychological things that I learned were really important in generating a lot of advocacy. Then, there are the micro-levelists – making it easy, making it fun, making it more rewarding. For example, a lot of games do that. They build things to make it more addictive, all work. We’ve bottled all that and we’ve put that into our product so that you’ve got that exclusive tribe, the people are getting feedback, they’re getting social capital and they make it “game-ified” and fun, so that people want to come back in again and again. It really works. We’ve now come to the point where I think that we’re building something that is going to become a new standard for how companies go to market by putting their customers at the heart of the way they go to market. How important are customer advocates and why should we create or be involved in their community? Mark: Here’s one of the things that I’ve seen, especially lately, maybe it’s because I’m running a company that’s all about advocacy, but the industry leaders in almost every sector are also the advocacy leaders. Like for example, Tesla in cars. Tesla’s market cap is equivalent to, I think, nearly all the other car companies combined at this point or very close to it. I’m thinking, why is that? They are also an advocacy leader. They don’t have any commissioned salespeople. They don’t do traditional marketing. All their marketing is done really through their own customers. The impact of that is just incredible because you’ve got this massive unpaid sales force that’s way more efficient than any sales force that you hired could be. Mark: The other thing that we’ve learned is that advocacy is kind of like a beneficial virus. For example, a company that’s built with advocacy, that has a lot of advocacy, those customers that become a new customer because an advocate recommended them, they, themselves, are much more likely to advocate. Essentially, there is a culture of advocacy around these companies. These companies rocket up to being industry leaders. They are so much more efficient regarding their sales and marketing, and they’ve got the culture that keeps this sort of positive feedback group happening, which I think is really exciting. We see that with a lot of our customers, they’re industry leaders. So many of our startup customers have gone public (i.e., MuleSoft) or there’s so many of them that have gone public, or they’re industry leaders like Oracle or SalesForce, IBM. I think why they do well is because of this financial power of having a large unpaid army of advocates. It feels amazing to work for companies that have a lot of customer advocacy. It gives you that sense of purpose, like, I know why I’m here. We’re adding real value. Look at all these customers we’re delighting, but they are helping us grow. It’s such an empowering, exciting thing to be a part of. I think the most important thing entrepreneurs can do is to build advocates and mobilize them. Now, also having a fantastic product and terrific service but we don’t actually get involved in that area. We actually only work with companies that have a great product, and that’s because we’ve learned the hard way that our product works really well for companies that are already delighting customers. Early in our history, we had a couple of customers who, frankly, were not doing a great job, but they might have had a handful of happy customers. And they wanted us to help give them a megaphone to mostly make it look like they had that kind of advocacy even if they didn’t. Honestly, we’ve learned that’s not a good business skill. We tend to work with companies that already do an excellent job delighting customers and we make sure they win. It feels like we are really doing good for the world because we’re helping the good guys win. Brian: I appreciate you saying that. This is going to segue us into talking a little bit about empathy. Often in marketing and sales, it had been outside-in, and what I’m hearing from you is, no, it’s from the inside out. It needs to be authentic. You connect with your employees. As you know, I’ve been doing some work in empathy-based marketing and selling and how it can help us connect with our customers and create better results. How can empathy and advocacy based-marketing connect and help empower companies? Mark: I love this work you are doing on empathy. As an entrepreneur, with every year that goes by I realize more that it’s the number one skill, I think, that business leaders need to develop to win. Often it’s thought of in an employee context for sure. For example, I’ve worked with a coach for the last three or four years namely working on developing my skills as a leader, which includes being more empathetic. Meaning truly and deeply understanding my employees and in particular, feeling what they are feeling, but it extends way beyond employees. That is why I love the work you are doing about being empathetic for companies and understanding their experience. In fact, this whole business that I’m doing came from a place of empathy in the beginning, because it was all about understanding what the most desirable buying process for someone to go through. Mark: If you think about the last amazing buying experience you’ve had for something that wasn’t just a commodity, but something you had to think about really. The chances are that process you went through had some trusted people whether those were other customers you trusted or that salesperson you worked with did such a good job that you truly and deeply trusted that person. You trusted this individual had your best interest in their heart. The chances are that trust and that transparency was just completely interwoven in that buying process you had. That’s what I learned when I was at Eloqua and trying to figure what was going on that some of these prospects who bought in four days instead of four months? That experience had tons of advocacy all over it. People talk about customer experience all the time, right? I’m not sure some people even know what it means. To me, customer experience is all about feelings. It’s all about the way people feel at different parts of their journey with you and so if we want to make people feel great, if we want to make people feel like there’s trust then you’ve got to infuse that buying process with the power of authenticity, authentic other customers. There’s an intersection right there. If you care about your buyer, if you care about their experience, and you want them to feel great when they are working with you then, you should probably talk less as a salesperson and as a marketer. And have more of their trusted, relevant peers do the talking for you, not because it’s more effective, but because they like it. That’s the experience that they really want more than anything. I think there is a massive overlap between the ideas of empathy and advocacy. Brian: I love that and I agree with this as I’ve done research in understanding this perspective and thinking of customers and how are they feeling. They want to know, how you’ve helped people like me? What has worked for others in my field and how can I get better doing what I’m doing? Because there is that authentic someone who’s been in my space or experience. I just wanted to talk about some actual tips you might have for our listeners today who feel inspired. They realize they have advocates right now, they may not have even used that term. I love the word advocate and what it means. How can marketers start identifying and better supporting their customer advocates? Mark: That’s a great question. We’ve produced an interesting piece of software to help mobilize advocates at scale, but it doesn’t mean you have to do that. 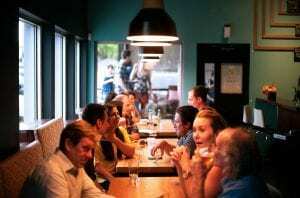 Really, every company in the world should be doing advocate marketing and it may be as simple as just having a meal a couple of times a year with some of your best customers. There’s really no agenda there other than to get people together and to ask how to improve and maybe share a little bit about where you’re going as a company. That alone can cost very little. We have these dinners all the time, and they cost $1,000 to get eight people together at nice restaurant and have a small boutique meal and wow, it just makes a big impact. Because those people are your best customers, they want to affect your company, right? They want to help shape your company. In some cases, they may already feel like they are more a part of your business than their company because they believe so passionately in your idea. By giving them an exclusive tribe and saying hey, this dinner is not just for any one of our customers. It’s for our most special customers. Not because you buy a lot from us either, by the way. It’s not about purchasing. It’s because you get it. It’s because you believe and we think that your ideas are leading edge and are going to be ones that everyone else is going to subscribe to, so we want to spend more time listening to you. We want to take care of you. That message will always be well received. It’s very inexpensive, and it’s got a very high ROI. Just beginning there is a great place to start. I know a lot of companies are already doing that before we start talking to them and they have people believe in advocacy and it appeals to them. The next step is to centralize your advocacy with a single person doing the talking. A lot of the companies that we work with before we started working with them, had four or five different people in their organization who are all doing little bits and pieces of advocacy in their own way. You might have one person in charge of referrals, another person in charge of talking to customers. The problem there is you’re really missing out on a lot of potential advocacy. That same person that can be a reference for you is also willing to speak on stage. If you have a point person who is in charge of advocacy for your company, you’ll get a lot more, three or four times as much, without spending any more money. In fact, you could actually end up saving a lot of time, money and frustration because you centralize that process. Again, that’s actually a very empathetic thing, right? Because what you’re saying is: you know what I care about more than the types of things that advocates do? We care about the advocates themselves. We actually care about people. We care about their experience. We want their experience to be great. By having a single person in your company in charge of that, I think that is showing a lot of respect and appreciation for these very important people. If you just do those two things alone without buying any fancy software, you’ll get a lot more of this very valuable advocacy for your company and it could be quite transformational. Then, maybe you’ll be ready to have a really scaled up advocacy program, and that’s what we do at Influitive. We create communities where there are some virtual places on the internet and on mobile where you can invite your advocates in, make them feel like a million bucks, let them know how they can help you and get them to interact with each other. We have about 300 great companies that are doing that. They are enjoying the experience, but there again, you don’t have to do anything fancy. Just get people together and show some appreciation. You’ll get a lot of value out of it. Brian: That’s terrific Mark and thank you for the action points. I was going to ask you one last question before we close. What’s the question you wished I asked but haven’t yet? Mark: Maybe something about the future? Often a good one is to bring out the crystal ball and see what we see in the future of marketing and that sort of thing. Brian: That would be great. What do you see in the future for B2B marketing or selling macro trends? Mark: Something which I’ve sort of alluded to in this conversation was around the “whys” of customer experience and the role that marketing is going to have play in customer experience. One of the things that you’ll notice, some of the best companies that we have, particularly in the west, are ones that are obsessed with customer experience. I think as you have more buyers that are inundated with emails and websites and all sorts of stuff like that. Marketers are going to need to have some control over the customer experience in the future because that is going to be the main source of where their best leads are going to come from and their ability to convert those leads. We see with our customers, which tend to be on the leading edge of the curve, where marketing and customer success are starting to merge a little bit. It’s very analogous to how sales and marketing began to come together in my Eloqua days, under the idea of the standard definition of a lead. Mark: I have done sales and marketing stuff together, and you’ve done a lot of writing on that. I’ve learned much from you over the years on that. There is a similar thing that is happening now. The customer success and marketing and product are coming together to define what the optimal customer experience is and that is a big, big move. Marketers who can get on that and understand this new language of customer experience and be able to drive it are going to do very well over the next few years. I think that’s one big trend. I do think that this idea of marketing by proxy is tremendous. It’s a huge thing and these are skills that most marketers do not have today. Marketers now are good at running these cross-functional, multimodal, nurturing-style campaigns to drive leads and this sort of thing. The ability to do that has been really dominant over the last 10 years. That’s changing as buyers are becoming kind of inundated with that stuff, yet, the ability to get others to do the marketing for you and learning those skills are going to be pretty significant. Because there is such little knowledge in this area, we actually have quite an education effort out there. You can go to Influitive.com and check out our resources page, and there are lots of educational materials, as we are trying to train this next generation of marketers in how to think this way. Instead of thinking about, how do I bombard people to get my way? It’s how to find the right individuals who are relevant and trusted and how do I get them to carry our message for me? I think that’s going to be a big deal. And thirdly, everyone is talking about machine learning and all that these days and I think it’s probably going to create just as big an impact. I think AI machine learning is probably at the very top of the high curve right now. Mark: Three years from now everyone is going to say well, I don’t know what that was all about, I guess that was all hyped up, but then in ten years from now people go wow, that really was a huge change. So I think it’s definitely worth tracking what’s going on in that technology and we’re certainly spending quite a bit of time playing around with it here. Some of the things I see for marketers, (and actually, there are a lot of sales professionals who listen to your podcast) I think empathy is just as important if not more so for sellers and so is advocacy, so is mobilizing your proxies if you are in the sales profession as well. I think there are a lot of parallels. Advocate marketing blog: What the heck is advocacy marketing? 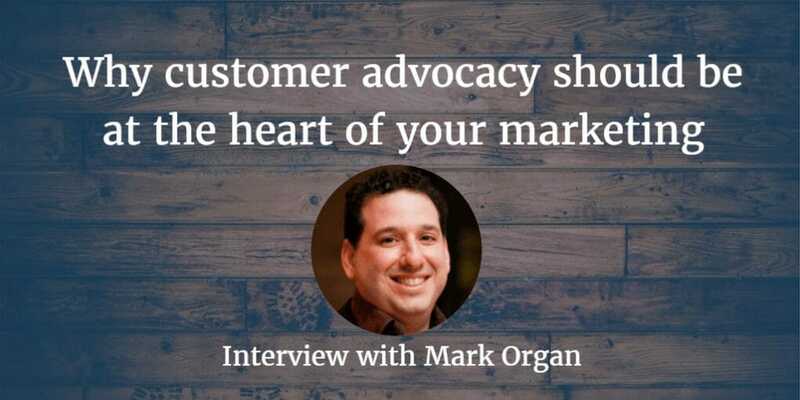 The post Why customer advocacy should be at the heart of your marketing appeared first on the B2B Lead Blog.